On December 9, 1960, the first episode of British soap opera Coronation Street was broadcast on Granada Television. Still going strong 54 years and over 8400 episodes later, the show is broadcast several times each week in the UK and many other countries where the show remains popular with ex-pats and anglophiles. Although billed as a true-to-life portrayal of working-class city folk, the constant demands of the ratings battle with other soap operas such as Eastenders and Emmerdale mean that storylines feature many more elaborate murders, passionate love affairs and assorted disasters than are found on your typical English street. 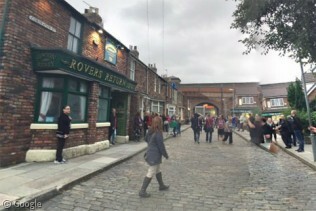 This Photosphere by Mark Crossfield shows the former Corrie set at Granada Studios in Manchester when it was open for public tours. Earlier this year production moved to a new set – which took two years to build – elsewhere in the city.